The Glan Aber Hotel is ideally located in the heart of Betws Y Coed; an area that has become a beacon for adventure holidays. We are surrounded by such beautiful Snowdonia landscapes that are just begging to be explored, with our relaxing and comfortable rooms being the perfect place to stop and rest after a long day’s adventure. Speaking of adventure; you may have heard of Zip World. We are only a very short drive away from all of their facilities that often peak the interests of even the most daring individuals! The Zip World Fforest can be found nestled away in the Conwy Valley. The woodland setting is perfect for this adventure as thrill seekers ride a traditional toboggan, picking up speed and winding through the trees from the top of the ride to the bottom. Alongside the Fforest Coaster are the Treehopper and Zip Safari rope courses. You can explore the forest from a different angle as you bounce and hop along the rope course and Tree Top Nets at your own leisure. If that’s not enough, why not take a seat in Europe’s highest five-seater swing, the Skyride! Zip World is home to the fastest zip line on the planet and the longest in Europe! Isn’t that absolutely fantastic!? The zip line will take you through Penrhyn Quarry; a historic landmark that houses a stunning lake that makes for a truly phenomenal spectacle, at speeds of up to 125mph and more. There is plenty to do for those who are accompanying the adventurers, with a viewing platform and restaurant. 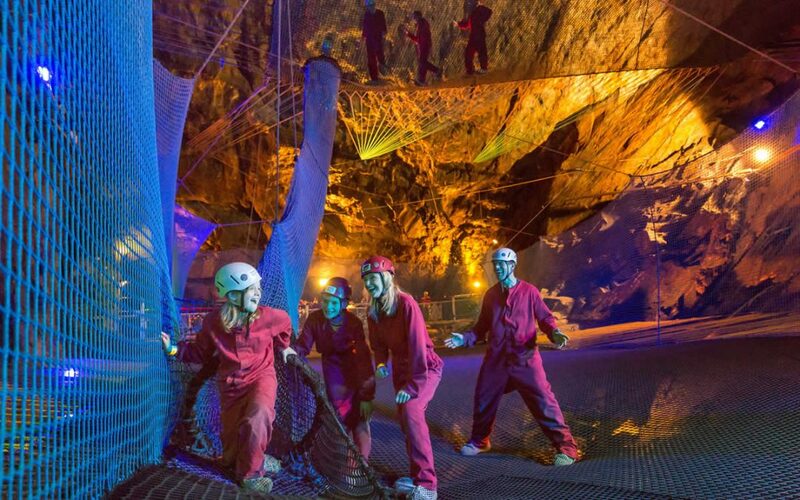 This underground adventure playground is located in Blaenau Ffestiniog. The six enclosed nets are connected by walkways and slides that make for an incredibly fun time. After a hefty refurbishment period, Bounce Below is now home to four industrial slides and six levels of bouncing fun that is worth every single penny! The Glan Aber Hotel is the perfect base camp and we look forward to being a part of your adventuring holiday in Betws Y Coed. If you require further information on the area then do not hesitate to contact us today to find out more!